Contact us now for your Kenny Heating & Plumbing Gas Boiler Upgrade. 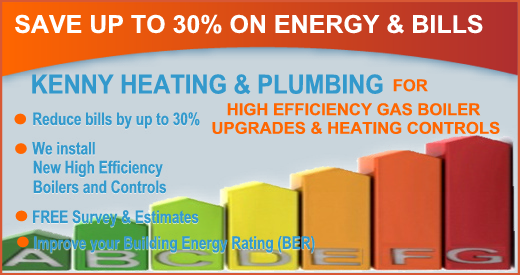 You can save up to 30% off your gas bills by installing a new high energy efficient boiler. Kenny Heating & Plumbing supply & install all major brands and types of gas boilers and we only install the latest High Energy (HE) efficient, condensing gas boilers. 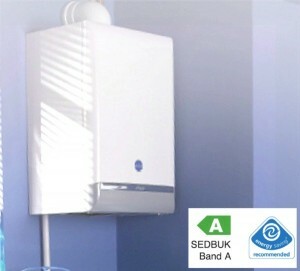 We replace your old gas boiler with a new high energy efficient, condensing gas boiler. Upgrading your gas boiler results in a substantially reduction of your carbon footprint and a considerable improvement in your home's Building Energy Rating (BER). Kenny Heating & Plumbing also provide the option to combine a boiler replacement / upgrade with Heating Controls upgrades including new thermostat controls and Thermostatic Radiator Valves (TRVs) in order to even further improve your energy savings.